Figure 1. 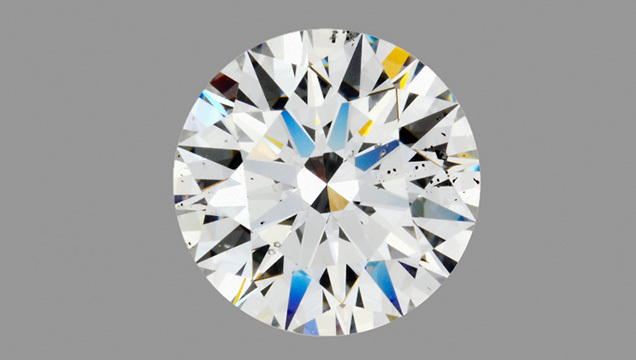 This D-color 2.23 ct natural diamond was originally submitted as a synthetic. Photo by Robison McMurtry. When a declared synthetic diamond is submitted to a GIA laboratory, it is not often that the diamond turns out to be natural. 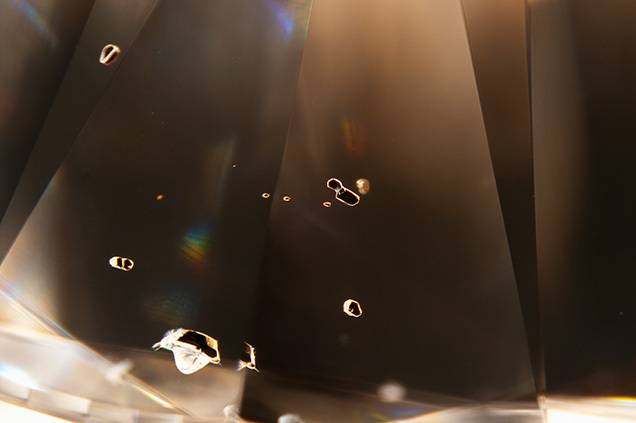 But this was the case recently when a D-color 2.23 ct round brilliant was submitted to the Carlsbad laboratory for a synthetic diamond grading report (figure 1). Its infrared absorption spectrum established it as type IaA>B, with nitrogen aggregates around 80 ppm, confirming a natural color origin. Since it was stated as synthetic, further analysis was performed. There are very few gemological indicators of lab-grown diamonds (S. Eaton-Magaña and C.M. Breeding, “Features of synthetic diamonds,” Summer 2018 G&G, pp. 202–204). Yet one of the most reliable and easily seen observations is the lack of birefringence (or strain) patterns in HPHT synthetics when viewed between crossed polarizers. To our knowledge, visible strain in HPHT-grown synthetic diamonds has only been documented in one rare case (Winter 2016 Lab Notes, pp. 417–418). Figure 2. An apparent lack of strain was observed throughout most of the stone, with strain visible only around inclusions (left). Such observations are common in HPHT synthetics and not generally seen in natural or CVD synthetic diamonds. With extensive searching and careful positioning, linear strain was visible within small areas of the stone (right). Photomicrographs by Garrett McElhenny; fields of view 7.19 mm. Although strain observations are rarely used by many in the trade, this natural diamond was perhaps presumed to be synthetic due to its apparent lack of observable strain. When viewed under crossed polarizers, the strain was very difficult to discern (figure 2, left), and this apparent absence was consistent with our observations of HPHT synthetics. With extensive searching and careful positioning, the strain was visible in a few scattered areas of the diamond. The observed strain was linear in appearance, consistent with type Ia natural diamonds (figure 2, right). Figure 3. Microscopic examination shows discernible dark mineral inclusions that occur naturally in diamonds and could have been mistaken for metallic flux inclusions. Photomicrograph by Garrett McElhenny; field of view 3.57 mm. With further investigation using a variety of techniques such as photoluminescence spectroscopy and DiamondView imaging, all tests confirmed a natural origin. Additionally, microscopic observation revealed unidentified dark natural crystal inclusions (figure 3), which might have been mistaken for metallic flux. Subsequently the client indicated that this stone was believed to be synthetic after examination by another party in the trade. However, several gemological and spectroscopic tests confirmed its natural origin. This diamond demonstrates why stones of uncertain origin should be submitted to a gemological laboratory for further testing. It also provides confirmation that occasional exceptions exist for the general guidelines that help distinguish natural from lab-grown diamonds. In this case, the correction worked to the client’s advantage. Garrett McElhenny is an analytics technician, and Sally Eaton-Magaña is a senior research scientist, at GIA in Carlsbad, California. Linear strain patterns are found in an HPHT synthetic diamond.